The affordable Kodak ESP Office 2150 is an all-in-one unit ideal for home users or small offices. It boasts speedy printing and copying performance and delivers high-quality text documents and photographs. The ESP Office 2150 printer can deliver a maximum resolution of 4,800 x 1,200 dpi, while the copier boasts a maximum resolution of 600 x 600 dpi and the scanner, 9,600 dpi. The Kodak ESP Office 2150 does not offer a PictBridge port. This all-black multifunction unit can print, scan, copy and fax. It has a flatbed scanner with automatic document feeder. The control panel has a colour LCD display, organised function buttons, and a numeric keypad. The rear vertical output tray can handle 150 sheets while the ADF can handle 30 sheets. 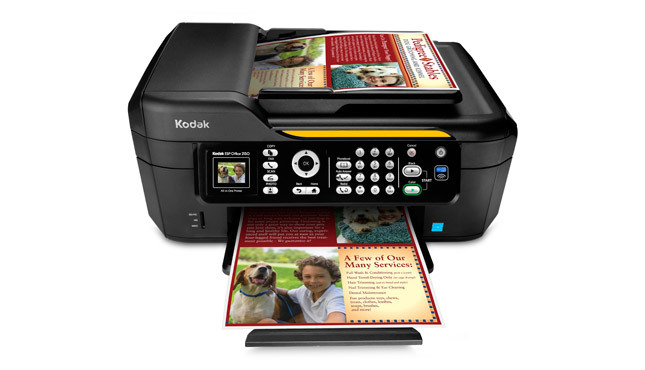 The Kodak ESP Office 2150 all-in-one inkjet printer measures 11.7 x 17.9 x 25.6 inches and weighs 15.20 lbs. The reliable Kodak ESP 2150 delivers consistent faxes, prints, copies, and scans. Users can easily share the Kodak ESP Office 2150 inkjet colour printer as it has built-in Ethernet and is compatible with most operating systems. The ESP 2150 can continuously copy up to 99 pages and it has a memory card reader for easy and direct photo printing. The Kodak ESP Office 2150 printer does not offer a PictBridge port for printing from digital cameras. It also lacks a handy duplexer and Ethernet connectivity.